Apple Japan's Reaction to Japan's 9.0 Earthquake!!! Apple Japan’s Reaction to Japan’s 9.0 Earthquake!!! 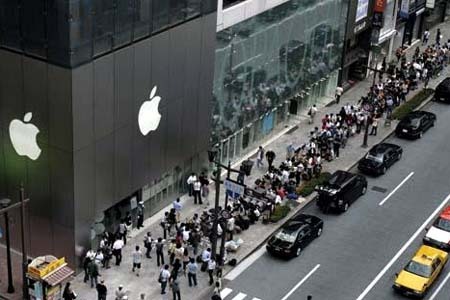 Apple Tokyo Store offers Japan earthquake victims shelter. I almost cried when I read this article from Kevin Rose. I am so touched with how Apple Japan and Apple Inc handled this Japan earthquake issue. This is certainly a company that not only high tech but also high ‘touch’. I will continue to support Apple. I believe this is also a kind Corporate Responsibility (CR) which is not meant to polish a company’s image but doing the right thing to make a difference in their communities. Kudos to Apple Japan! Hi this is XXXXX in Japan. As you all must have heard, the 5th largest earthquake in recorded history hit us on Friday, 2:30pm Japan Time. As Alex often says on TWiM, stories on the ground are often quite different from the stories in the news, and there is a tech story that I’d really like to tell: the story of Apple Inc in Japan. Full disclosure: I work at Apple at one of its stores in Japan. The earthquake hit while I was working on the first floor of one of their stores. As the entire building swayed, the staff calmly led people from the top 5 floors down to the first floor, and under the ridiculously strong wooden tables that hold up the display computers. You know how in disaster movies, people on the street gather around electronic shops that have TVs in the display windows so they can stay informed with what is going on? In this digital age, that’s what the Tokyo Apple stores became. Staff brought out surge protectors and extension cords with 10s of iOS device adapters so people could charge their phones & pads and contact their loved ones. Even after we finally had to close 10pm, crowds of people huddled in front of our stores to use the wifi into the night, as it was still the only way to get access to the outside world. Anyway, I mention this not because I work at Apple now, or because I’m an admitted fanboy, but because I’m genuinely proud of the Apple Japan staff and their willingness to stay open to help people that day. And I’m also impressed with the way Apple’s products (and yes, Google’s, Twitter’s, and Facebook’s) helped them that day. Even after we had to close, many of the staff stayed outside the store to fixing iphones and teaching people how to contact family or stay informed via wifi. TWiM, TWiT and Rev3 have talked about the power of tech & the cloud during the recent global events, so I wanted to let you know of one more example during the Great Tohoku Earthquake in Japan. As of the writing of this, another nuclear plant just had an explosion so I will keep the 2nd half of the story as brief as possible as I may need to evacuate soon (weak smile). 1. Because the trains and phones were down, almost everyone who worked in Tokyo was stranded deep in the city. All the hotels were booked, the roads were jammed, so hundreds of people were instantly homeless. Apple told all of their staff – Retail AND Corporate – that they could go sleep at the Apple stores. The Senior managers at the stores had been notified earlier and unbeknownst to us, had gone out to stock up on food and drinks after the very first quake hit. 1a. The corporate offices are in skyscrapers with over 50 flights of stairs. With all elevators in Japan shutdown, this was a nightmare. 1b. The Retail stores were the only areas where WE controlled the buildings, from top to bottom, so we could monitor, fix, and maintain the back-up power, networks, and heating ourselves. 1d. With theater rooms and breakrooms designed for 150+ people, the Apple stores were the most comfortable places to be and to sleep. Much more comfortable than sleeping on the street on a cold March night. 2. Once staff let their families know that they were not only safe but how comfortable we were (break room refridgerators stocked with food and drink, etc), family members began asking if they could stay at the Apple stores as well. Of course Apple said yes. One business team member’s stranded mother walked 3.5 hours to be with her daughter at the store. When she arrived, the Apple store staff gave her a standing ovation (“Warm Welcome”) like they do for customers during a new launch. If, on their way home the staff member realized they couldn’t make it, but they found an open hotel, Apple would pay for it. Since many people lived 2-3 hours away, this ended up meaning 11 hour walks home, $300 taxi fares, and $800 hotel rooms (only the luxury hotels had vacancies). Executives from Cupertino and London Facetimed with us, letting us know not to worry, they supported us, and that they would write off on it all. And lastly, as I write this now 3 days later, even though the Japanese government says everything is fine, nuclear plants continue to explode. And we still haven’t even gotten the 7pt aftershock that is predicted to come this week, nor the nuclear/acid rain that is predicted to fall within the next 3 days. I hate to say this, but things may only get worse before they get better. I’ve been calling my girlfriend at work, asking her to come home, but because the Tokyo government hasn’t said anything, her company won’t let her leave. On the other hand, my manager at Apple called me to let me know that Apple will support any decision I make regarding leaving the country or the area, and that a job will still be waiting for me if I decide to come back. That is why I am a fanboy. Ack! Sorry, that wasn’t brief at all! Next story Micheal Learns To Rock (MLTR) Rocking in Penang, Kuala Lumpur & Kuantan, Malaysia!!! Previous story iPad 2 Launch in Japan Delayed!